When you find out you are pregnant there are lots of changes coming your way. One of them that will come sooner than you think is the need to buy what feels like a whole new wardrobe. 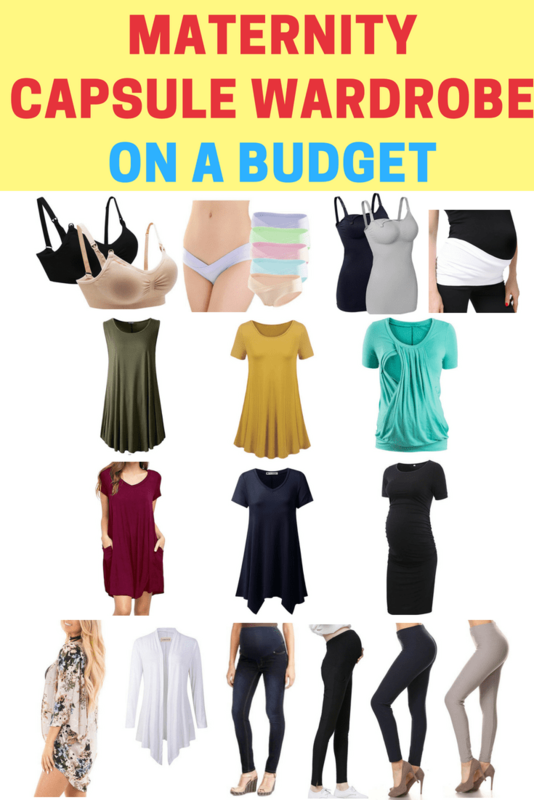 Instead of buying a million new pieces of clothing I saved my money and my sanity by doing a maternity capsule wardrobe with cute inexpensive maternity clothes. Capsule wardrobes are all the rage right now. If you don’t know what they are, the short explanation is a wardrobe with a limited amount of pieces that can be used interchangeably together to make many different outfits. I once read a new story about a lady who practiced a very limited capsule wardrobe, 30 pieces max including jewelry and shoes! She was worried that her coworkers would notice. Guess what. No one did. This is not because she wasn’t well loved around the office. It’s just because no one is going to commit your wardrobe to memory like you will. You are absolutely your own worst critic when it comes to outfits. A good capsule wardrobe can take the stress out of dressing each day plus save you space and money. 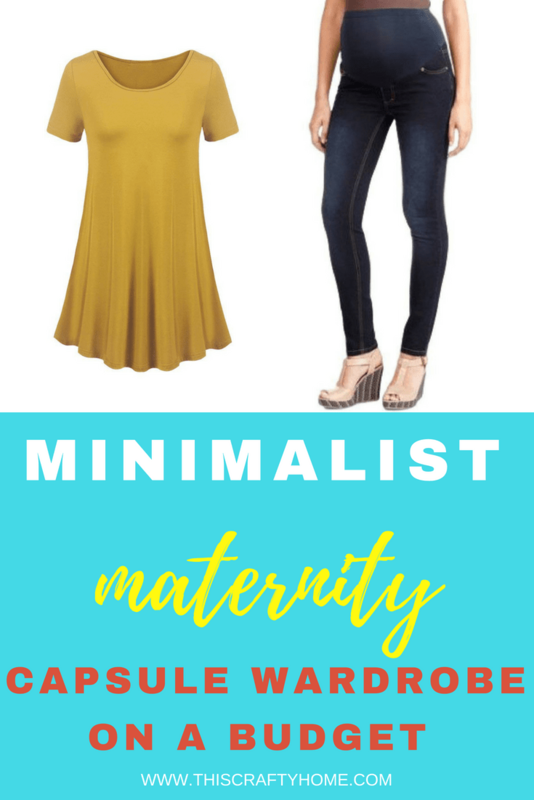 The goal when you are trying to save money and build a maternity capsule wardrobe is to get cute inexpensive maternity clothes that work really well together. There may be affiliate links in the following post. I’m not going to include anything here that you won’t have to change for maternity like socks, shoes, and accessories. These are all things you might have to buy for your maternity capsule wardrobe. Belly Band– This would be the first thing I would buy. It’s a magical band that will let you wear your normal pants a little longer without having to resort to the not so trusty hair tie trick. The added bonus to this band is that you can use them after having your baby as well. Tops– Stick to some basic shirts that are short sleeved. When you are pregnant you get hot very easily. Having short-sleeved shirts will let you layer so that when you can deal with your fluctuating body temperature without buying two different wardrobes for each season. 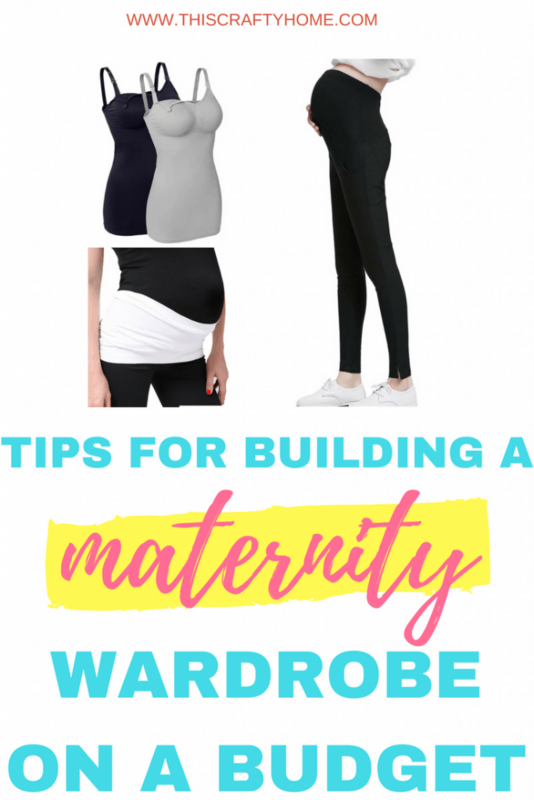 Bottoms– Getting two really good pairs of pants will make all the difference in your maternity wardrobe. Stick to neutral colors that can go with any of the other pieces you buy. Leggings– You should be able to use your pre-pregnancy leggings as long as they aren’t compression leggings are decently stretchy. The one size fits all kind usually work like a charm. If you don’t like wearing leggings you can skip these, but they are something super easy and comfortable for when you are lounging around. Dresses– I suggest having one little black dress on hand for maternity wear just in case. It is flexible and can be used if you need something more formal in a flash. Cardigans– You may already have these in your wardrobe, if not look at what time of year your pregnancy will take you through. More than likely you will see more than one season. 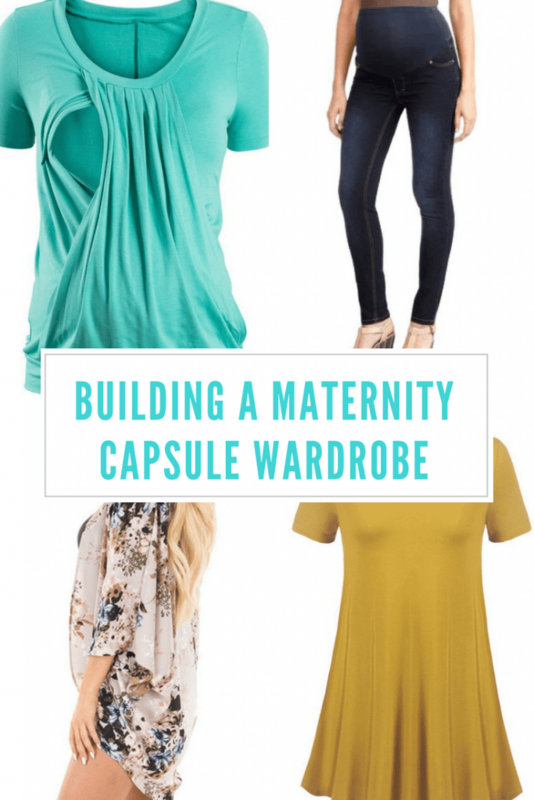 Having a cardigan on hand can transform your short sleeve maternity shirts that worked in the summer to a maternity outfit that is perfect for a winter day. Nursing Camis– More than likely your normal cami’s will become too short to wear as your belly grows. I would suggest buying nursing cami’s in the meantime if you plan on breastfeeding so that you are ready for when your baby comes. You can buy them a size up to make sure the length is good and usually they’ll still fit snug. Nursing Bra– If they haven’t started yet your breasts will grow while you are pregnant and the bra’s you are wearing now will get very very uncomfortable. I would go ahead and buy a comfy non-wire nursing bra so that you don’t have to buy all new bra’s again after you have your newborn. Don’t be afraid to shop used. 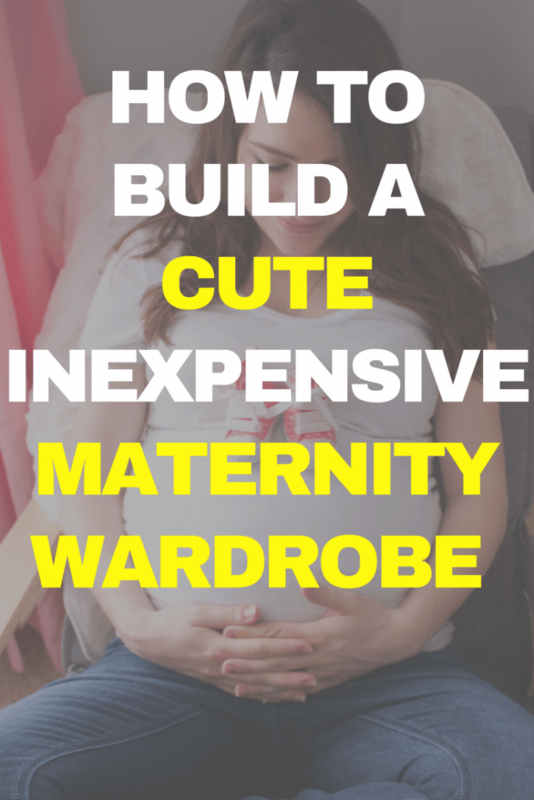 Maternity clothes are typically expensive, and not worn long. 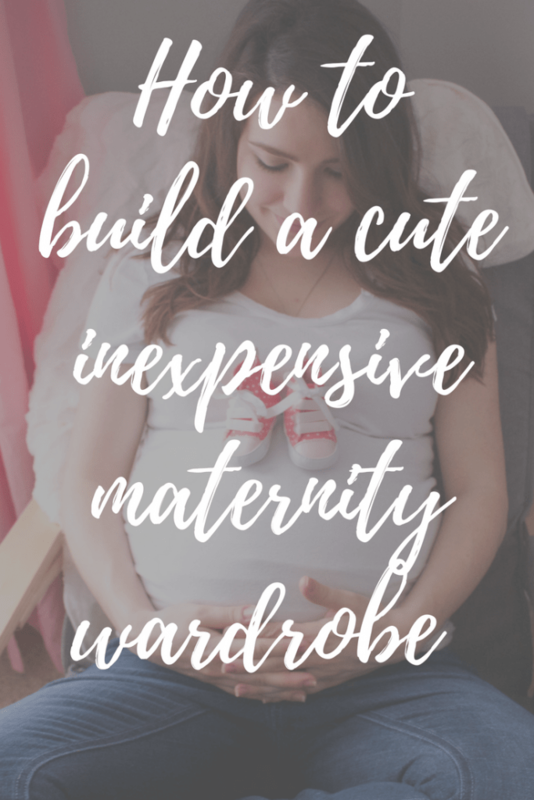 You’re more than likely going to be able to find cheap maternity clothes that are of decent quality at yard sales, on Facebook Marketplace, resale shops and even from friends. Try shopping in sections other than maternity. I found some of my favorite ‘maternity’ pieces in the clearance section of Kohls! The nice thing about today’s styles is baggy is in. This makes it easier to find things that will fit you before and after pregnancy. Watch sale sites like Zulilly for cute inexpensive maternity clothes on deep discount from their actual price. Especially if you need something like a swimsuit this site can really come in handy. Shop your own closet! Don’t discount pieces you already have just because they aren’t made for maternity wear. You may do just fine with what you already have. Anything that you can find that you can wear before and after pregnancy is gold. Why spend your money on a piece you’ll only wear 6 months when you can get something else you’ll wear much longer? Make sure when you are shopping to pick colors that all go together reasonably well. Don’t pick out a shirt that can only go with one of your bottoms. It will limit your wardrobe drastically. Don’t let quality be too much of a worry. These clothes need to last 9 months. That’s it! As long as you think it’ll hold up for that long I wouldn’t worry too much about it. I’ve just stuck with Amazon for the entire maternity capsule wardrobe because I’m hoping that will let you actually be able to find these things even when they might be out of season at other stores. Plus, who doesn’t love prime shipping? Also, all the prices are what they were listed as at the time of publication. This absolutely could change cheaper or more expensive with Amazon. This is just one example of how you can build a cheap maternity capsule wardrobe, at full price! If you utilize the tips above there won’t be any issue finding pieces cheaper than these to make your own cute inexpensive maternity wardrobe. Want a little more help getting ready for baby? 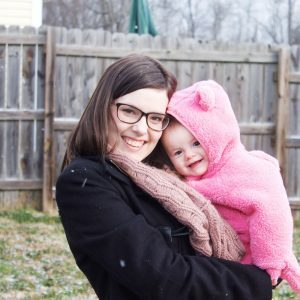 I’ve made a FREE eBook all about getting ready for baby. I cover everything from getting your finances in order to getting your home ready. Need inspiration for your maternity outfits? Check out our board below!